The Follower role in Tango is a whole world of being constantly perceptive to subtle signals from the leader and reacting with presence and expression. 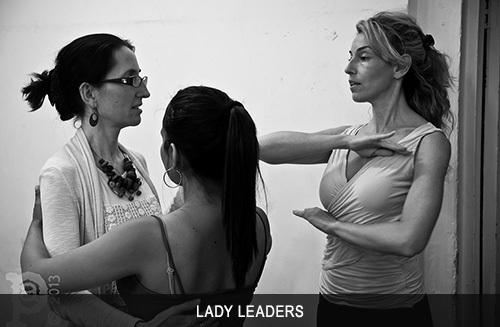 In order to fine tune this magic body conversation within the improvisation and the tango embrace, special classes dedicated to the follower role are held. In these tango classes we build up a solid stylish technique going through all the necessary elements such as posture, balance control, relaxation of legs, strengthening the supporting leg and the core, stylish the footwork, spiral and circular movement, decorations etc..
Ladies Tango Technique workshops are based on a unique method Raquel has developed based on her own experiences through the years as a dancer and in particular as a tango dancer. Teaming up with a variety of dancers including Junior Cervila, Pablo Veron and others; studying and dancing with the most marking maestros of both traditional and the modern tango; living in Buenos Aires and being close to the older generation of tango dancers (as they took her under their wing and shared with her their wisdom and stories) — all together led her to develo her own personal perception and style. A special emphasis on effective analysis of body movements and musicality to reach a fluid, smooth, expressive, sensual and musical dance. 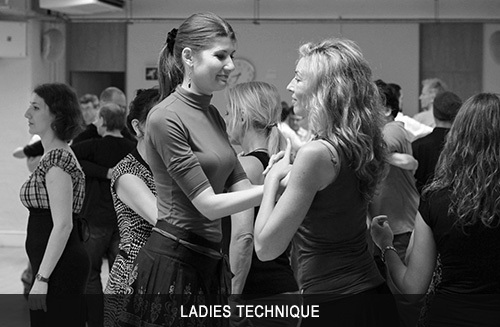 The goal of these tango workshops is to give you tools to improve your technique and your following skills in order to boost your enjoyment of the dance, to feel more comfortable, confident, present, having fast and precise reactions to the lead, enjoying fluidity and elasticity in your dance. Bring elegance, grace, musicality, aesthetic lines, presence and expression to your dance! Individual workout, no need for partner for all levels. Classes are open to leaders (many similar technique issues for leaders and followers plus understanding better the follower moves to make you a better leader). It is recommendable to attend these workshops on a regular basis. Shoes – Please bring both practice shoes (like jazz/ballet shoes or soft split sole sneakers) and normal tango shoes with heels.